This touring exhibition, organised by the National Library of Australia, is the first major exhibition of the art of William Strutt undertaken for 35 years. It provides a fresh assessment of an early colonial artist and contains most of his key works, and numerous sketches and preparatory drawings. A number of works are also exhibited for the first time. 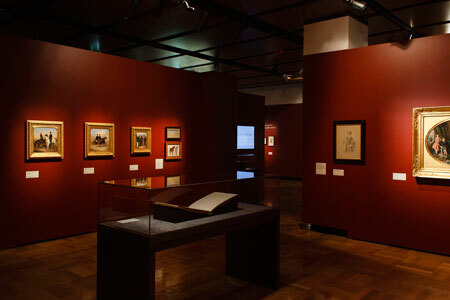 What emerges clearly from this large survey of over 100 works is that Strutt’s art provides a fascinating archive, of both historical and artistic value, depicting Australian life in the mid-nineteenth century. William Strutt was the quintessential Victorian artist. He was born in 1825, 12 years before Victoria became queen, and died in 1915, 14 years after the end of her reign. He began his artistic studies in England at the age of 14 and continued them in Paris. Curator Matthew Jones notes in the media release for the exhibition Strutt’s extensive academic training, ‘ability to draw the human figure and execute a large and complex composition’ and his interest in historical subjects. Nevertheless, Strutt’s major paintings on Australian history were not much appreciated in his lifetime. Strutt left England to seek new fields. He arrived in Melbourne – then a settlement of some 23,000 people – in 1850. He worked as an illustrator for publications such as the Illustrated Australian Magazine. He sketched the enthusiastic celebrations for the establishment of the colony of Victoria, Separation Day (commemorating separation from New South Wales), the meeting of the inaugural Victorian Legislative Council in 1851, the first sitting in the new Parliament in 1856, the beginning of the gold rushes and the departure of the ill-fated Burke and Wills expedition. Strutt, too, headed to the diggings to seek his fortune. He was unsuccessful, so returned to Melbourne and to art. He took his growing family to farm in New Zealand for a short sojourn, before returning to Melbourne in 1856 and then leaving Australasia forever in 1862. By the time he left, the population of Melbourne had grown to 125,000. Strutt departed just as the new city was in the full tide of an expansion of population and wealth that would see it become one of the richest in the world. Portraits were Strutt’s most successful contribution to the local Melbourne art scene and he was commissioned to do several of local identities, including the handsome portrait, Maria Elizabeth O’Mullane and Children (with unusual perspective so that one child almost appears to be aiming his bow and arrow at his mother). He also painted such notables as Sir Edward Macarthur and John Pascoe Fawkner, whose 1856 portrait is entitled Founder of Melbourne. Fawkner, a rival of John Batman, financed a ship to send free settlers up the Yarra but Fawkner was not on it. He opened Melbourne’s first hotel, published its first newspaper, was elected to the first parliament of the colony and worked tirelessly for separation from New South Wales. He would no doubt have been satisfied with Strutt’s portrayal of him as a visionary, rapt in prophetic contemplation of an inspiring future for Victoria. 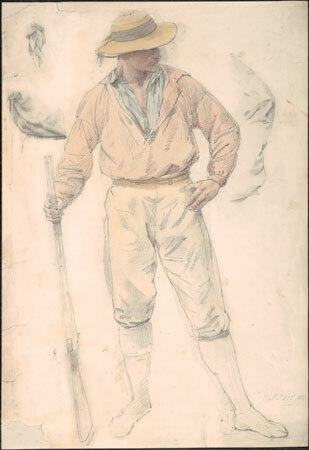 Of enduring historical significance are Strutt’s sketches of Indigenous people, including Charles Never Marunwilley, Tailor to the Native Police Corps, and the Black Troopers of Victoria, Melbourne, 1851. The Aboriginal troopers are portrayed in a way that echoes depictions of the ‘sepoys’ of the East India Company. They are shown in smart uniforms, riding their horses with style and exhibiting confidence and a sense of authority. One sketch represents two mounted Indigenous troopers bringing in a white miscreant, bound with ropes. Strutt’s visual depictions of Aboriginal and Maori subjects in the exhibition are fascinating. In New Zealand Strutt did several sketches of Maoris, including a lively drawing of Maori girls paddling a canoe. One of his best and most sensitive works is the small painting that he completed in England in 1863 of the Maori chief, Hare Pomare,and his family in which he captured the dignity and individuality of the subjects. The chief and his wife, Hariata, were presented to Queen Victoria who became godmother to their new baby, Albert Victor Pomare, the first Maori born in England. On his return to England, Strutt’s career failed to take off, despite his exhibiting at the Royal Academy, and he was forced to supplement his income with teaching. His subjects during this period were mainly historical, religious and animal paintings, but included several major Australian works. In fact, some of Strutt’s best known Australian works were done after his return to England, and it is ironic that these most characteristically Australian works were painted on the other side of the world. Many of the works painted in England convey a sense of melancholy, giving the impression that he thought Australia was a good place to stay away from. Strutt struggled to sell these works and most now in Australian institutions were acquired decades after being painted. In 1864 he painted Black Thursday, February 6th, 1851,now in the State Library of Victoria, an enormous panorama of terrified people and beasts, fleeing the flames of the largest bushfire then recorded in Australia. Strutt wrote vividly of the oppressive atmosphere in Melbourne that day and the flies swarming everywhere: ‘I can never forget the morning of that scorching Thursday … the sun looked red all day, almost as blood, and the sky the colour of mahogany. We felt in town that something terrible (with the immense volumes of smoke) must be going on up country and sure enough messenger after messenger came flocking in with tales of distress and horror’. This was followed in 1865 by sketches for a storybook about white children lost in the Australian bush, in which the children’s father goes to the Aboriginal people to ask for their help, and the role of the Aboriginal trackers is critical in finding them. Strutt’s oil painting Bushrangers, Victoria, Australia, 1852 in 1887 would have been another possible deterrent for intending emigrants, remarkable for the imposing figure of the leader of the gang and the terror of the coach party, probably justified as there is a dead body in the painting. There is also the series of paintings and sketches commemorating the deaths of doomed explorers Robert O’Hara Burke and William John Wills. Strutt had sketched and photographed the expedition leaving Melbourne in 1860. Later, in England, he hoped to receive the memorial commission which went to John Longstaff. 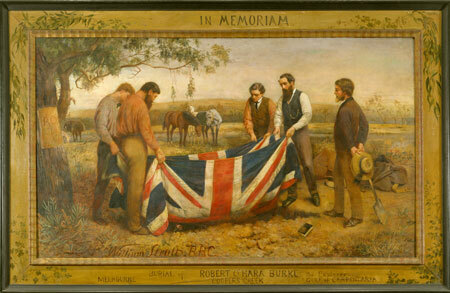 His final artistic reflection on his Australian venture was The Burial of Burke, painted in 1911, depicting the explorer being laid to rest, swathed in a British flag, in a sunburnt Australian landscape. Adult visitors will learn much from the exhibition and children will obviously respond to the narrative content and the appealing depictions of animals. Although many images are on-line from the various institutional lenders, a catalogue would have provided a welcome permanent record to complement Heather Curnow’s 1980 publications, The Life & Art of William Strutt and the catalogue for the 1980 Art Gallery of New South Wales exhibition, William Strutt. Caroline Turner is an adjunct senior research fellow in the Humanities Resource Centre, The Australian National University. Glen St John Barclay is a historian who taught for many years at the University of Queensland.